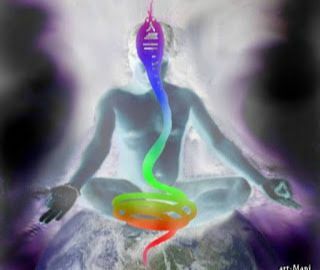 ​Kundalini comes from the word kundala which means coiled. Kundalini is the name that yoga practitioners gave to the awakening to your full potential, and is depicted as a snake coiled at the base chakra. The journey to raise the Kundalini always begins in the base. When all seven chakras have been cleared and opened, the Kundalini activates, or the serpent awakens and begins to lift up toward the crown. The kundalini normally lies dormant. By awakening its power you will be able to experience conscious enlightenment and healing. It is important to note that you cannot open the kundalini without having open and balanced chakras. Energy (prana) currently exists in you and it can flow in and out of any chakra centre, but the kundalini energy is the potential energy, which is normally dormant. By opening your chakra you can active this energy lying in the kundalini. Here you will journey through the yoga exercises both breath and postures combined with kundalini yoga through the chakras to raise the kundalini, thereby linking them together to create a fully enlightened and unified person (unified in body, Mind and spirit). Yoga means unity. It is the perfect blending of mind, body and spirit that creates a unified and balanced person. By achieving the unity, you will have a better understanding of your journey in life, which will give you peace, wisdom, good health and fulfilment. Hatha Yoga is the yoga of breath and postures, and it is the yoga style most commonly practices in western cultures. You will be using controlled breathing throughout these exercises, but as it also activates the brow chakra, we will look at other types of breathing practices that can be done with the postures or meditation. If you have mobility issues props such as benches, blocks, straps and blankets can help you achieve the necessary alignment in the postures. It is important to learn the accurate physical alignment of the postures so that not only will your practice be more successful but it will also minimise the possibility of injury. Always remember that yoga is about the journey, not the destination. So there is never any need to rush from one place to another. Start the poses slowly, only bend as far as you can without pain and then move back. As you practice and progress further you will find that you become more flexible, but never push past your threshold just to be able to do what someone else can. Yoga is a journey of self discovery not a competition. ​ The chakras are the seven main energy centres that correspond to points along the spine. The energy of each centre helps you tap into different strengths as well as regulating you health and well-being. When you experience an emotional or physical ailment, the problem can generally be traced to a blockage in a chakra. Ideally when all chakras are open, clear and healthy, the potential energy (Kundalini Energy) that is coiled at the base chakra can travel all the way up to the crown chakra. This allows you to live in a state of enlightenment of the mind, body and spirit. There are many ways to open the chakras that have become closed, meditation, wands, crystals, reiki, etc. Some of which are discussed in this website. Yoga, is also and effective way to open chakras, it also raises the potential energy (Kundalini) within you, and that is the method on which this section is based. Yoga postures have the ability to open any of the chakras, but some pull energy through one centre more directly than others. If you are opening the base chakra, a side effect could be that your solar plexus chakra improves also. Make sure your shoulders are over your hips and your ears are over your shoulders. Lift your chin slightly and relax your shoulders, keeping your posture tall. If you have good posture you will find that the balancing exercises will be easier for you. For some people though balancing doesn't come naturally and this will help them find their centre of gravity. As with all things this will only come to you with practice. Visualise the energy of the kundalini moving around and through the chakra to open and activate. A breath cycle is one complete inhale, followed by one complete exhale. As with all exercises, if you have a pose that concentrates on one side of the body don't forget to change over and do the pose on the other side of the body. The base chakra is the beginning of the journey. it is the foundation on which your being is structured. It also nourishes the rest of your body's functions and your energy system giving you stability. The types of yoga poses that open the base chakra are standing, sitting or balance poses. These poses require an active straightening of the spine and feet, or tail-bone anchoring to the floor. Actively practising good posture will allow the chakras to open more fully as well as relieving common pains throughout the physical body. If you most often answered YES to these questions then your base chakra is open. If you answered NO to most of these questions then your base chakra is blocked. The Mountain Pose is usually a beginning and an end to another posture as this posture is used to ground and centre the mind and body prior to moving on. 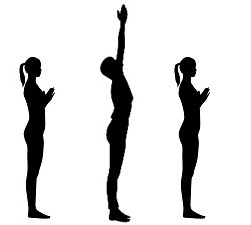 Stand in the good posture position with hands at prayer position or above your head. Feet are either together or shoulder width apart. Objective: Create perfect body alignment, allowing energy to flow through all seven chakras. Concentrate on your feet and feel the soles of the feet connecting to the floor. use the contact of the whole foot to the floor to keep your steadiness. Note the position of each joint travelling up the body. The ankles should be centred, not rolling in or out. If your ankles do roll to the side, your feet are not fully connected to the floor they are either rolled in or out. Make sure your knees are aligned over the ankles and under the hips. Point your tail-bone to the floor, this engages the abdominal wall and straightens your spine. The shoulders should be directly over the hips. next make sure your ears are aligned over the shoulders so that your head isn't tilted front or back. The top of your head should pull toward the sky or ceiling. Close your eyes and now focus on how it feels to be in perfect balance. Move gently side to side and back to forth to feel how it feels to be out of balance. While standing in this position don't lock your knees in place. If you use your joints to perform the postures rather than the muscles, you are not strengthen your body but damaging your joints. Mountain pose grounds the body and clears the mind. You are connected to your Kundalini potential and are ready to move it any place you choose. Stand in the Mountain Pose, then reach reach your arms up to the sky and lengthen the spine but keep your feet flat on the ground, continue lengthen as you reach forward and down toward the floor. Ideally you would place you hands on the floor beside your feet palms down. However most people are unable to do that, just bend as far as you can without pain and without bending or locking your knees. Relax your neck and shoulders and let your head hang down. With the forward bend you are relaxing the upper part of the body while lengthening the legs and spine allowing you to fully stretch the lower back. To focus the stretch into the hips, for a few breaths bend your knees a little and lift your hips up. Then return to the back stretch. Make sure that you are positioned over your feet and not leaning back onto your heels. You can also do the forward bend sitting on the floor if you are worried about falling over or have bad balance issues at the beginning. Stand in the mountain pose and then move into the tree pose. The tree pose is performed with the sole of one foot against the inside of the standing leg. Don't forget to do the pose on both sides. Your hands can be in the prayer position, by your sides or above your head. This is an excellent pose to an hold for long periods to improve your physical endurance and mental clarity. Never press your foot hard against your leg. Too much pressure can cause you to lose your balance or create strain in the knee. Never place your foot against the knee, always place your foot either on your calf or thigh with your toes pointing slightly back toward the back of your calf or thigh. Start on the calf and over time move your foot up to the thigh. Don't start using something as a prop or you will never achieve the necessary balance. Keep persevering it will come together. Stand in the mountain pose and then move into the tree pose and now move into the standing half lotus. In the standing half lotus grasp your foot and move it up as close to your hip as you can. Extend your free hand out to the side and then find your balance again. Make sure that your tail bone and the knee of the lifted leg is pointing toward the floor. When your comfortable you can place your hands in the prayer position or above your head, now keep your posture tall through the pose. Don't forget to do the pose on both legs. Begin with the mountain pose with your hands in the prayer position, to achieve the necessary balance to perform this pose. The eagle pose crosses one side over the other. If you are balancing on the right side you will keep both the right arm and right leg in place and cross the left arm and leg over them. Start by getting a deep bend of the knee, and then hold your arm in front of you, bending at the elbow. Cross the left leg over the right leg, wrapping your foot around the calf or behind the knee. Squeeze your thighs together. Cross the left arm under the right arm and grab your right wrist or hand with the left hand. Hold the position through several cycles of breath and repeat on the other side. Unlike other balancing poses that need a straight leg support, the eagle pose needs you to have a bent knee and hips and tail bone dropping down to the floor. Make sure your spine remains straight throughout the pose. The long spine with no curve continues the activation of the base chakra. Sit on the floor with both legs extended in front of you. Push the sit bones down into the floor and feel the centre of your chest lift. Let your shoulders drop. Feel the straightness of your spine. Place your hands either in your lap, the tops of your legs or press your palms into the floor by your sides. Feel your legs lengthen, pushing the heels away from your hips. Hold at this position and breathe into it: feel your breath in your body as if it is part of the pose. The deeper and slower the breath, the better. Then on an inhale, extend your arms upward. As you exhale, fold the body forward, reaching toward your feet. As you reach out, continue lengthening both the legs and the back. Keep your legs together. Be careful that you don't bend your knees, and thereby giving in to the tightening of the hamstrings, but instead pull against the tightening, keeping the legs long with a slow steady forward stretching sensation. Also continue to lengthen through the back so that you don't curve the spine in an attempt to extend the head or the chest toward the knees. Instead, feel the chest pulling toward your feet, keeping your spine aligned. Seated forward bend is an excellent stretch. Never hang down or release your body over the legs. Instead with each exhale, actively stretch the body out a little further. As you become more flexible you can grab your feet to pull yourself forward. Always stretch slowly. Give the muscles time to lengthen before you add more pressure to your stretch. Do NOT bounce through this pose as it is detrimental to your ultimate goal. Downward facing dog is both a stretching and strengthening pose as well as a multi-chakra opening pose. The energy from this pose will move from the base chakra through the sacral chakra to the heart chakra. Anchor your hands and feet to the floor and lift the hips and tail-bone up toward the sky. Lengthen the legs and the back, so you will be in an inverted V shape. Always keep your palms flat on the floor. It often helps to spread your fingers so that the focus goes into the palms. Let your head hang down so that there is no tension in your neck. As your lengthen your legs, push your heels toward the floor. For most people when they start yoga, find that their calf muscles are too tight to be able to put the heels on the floor. Don't worry, just drop the heels as far as you can for now, over time the muscles will stretch. The alignment of your body is very important during this pose. Your feet need to be spaced hip width apart and your hands shoulder width apart. Make sure that you are using a full length stretch and not making it shorter so that you can place your feet on the floor, from the side you should appear as an inverted v. Use the strength of your back and arms to stabilise yourself in this pose. Pull the shoulder blades up into the back and feel your chest open. Don't lock your arms and don't bend the knees. Pull the stomach muscles in to support the back and don't arch your back, you want a long straight ling from shoulder to hip. Hold the pose for at least 5 breath cycles to build up strength and endurance. If you get tired from this pose you can move into standing forward bend to rest and then move back into downward facing dog again. If you have pain in your joints, it means that you are not using your muscles to support yourself. If you wish, you can add to the stretch by extending one leg up. As you stretch the leg, make sure your hip stays in alignment so that it doesn't roll open and create a curve through the back. Take a few breaths in that position, anchor your foot back down to the floor and then stretch the other leg up. Don't force the leg up any further than is comfortable at first. Downward Dog is one of the best clearing and activating poses that you can do to awaken and lift your kundalini. The sacral chakra is the place where your sexuality resides. It is also the fountain of your creativity and the centre of pleasurable experiences. Opened sacral chakras engender nurturing, creative personalities. Think of this chakra as warm and passionate. A healthy sacral chakra isn't just sexual, it's sensual. A closed sacral chakra is cold and stagnant. Procrastination can also often result from a closed sacral chakra. This is even more the case if the base chakra is also blocked, since the base chakra gives motivation to the sacral chakra energy of creation. Do I enjoy tasting foods. If you find yourself answering YES to most of these questions, your sacral chakra is most likely open. If you find yourself answering NO, then you most likely have a blocked or closed chakra. Sacral chakra blocks most often manifest as lack of creativity, sexual problems or frustration in sexual relationships. When a sacral chakra is open, you tend to feel a natural creative urge - which can be expressed in any way that is natural to your interests. While the arts definitely fall into this type of creative urge, open sacral chakra energy may not cause a specifically artistic type of creativity. Having an open sacral chakra can result in a desire to make things. whether it's physically building useful fixtures around the home, creating or trying new recipes, find more efficient ways to run a business, or repairing household items. The basic Butterfly Pose is a seated position with the back tall and the soles of the feet together. It strengthens the back and gives a fairly intense stretch through the hips. A lot of people tend to be concerned with pushing their knees to the floor. If you can do that without straining, fine. Otherwise, do not worry so much with the knees. Focus instead on keeping the spine straight, as if you have your back against a wall. Have you feet as close as you can to your body because it gives you a greater stretch. Take a moment to breath deeply and assess your posture. Feel the sit bones on the floor. Tighten the abdominals just enough to hold them in, not so that you can't breath properly. Feel how each vertebrae stacks up on top of the one before it so that your back is straight. Relax your shoulders and engage the outer thighs, gently pulling the legs to the floor. Remember that just because you pull with the thighs doesn't mean that the legs will move. If the legs don't move please don't worry, continue to use the muscles in your thighs to pull down, but don't force them into place. Stay focused on the straight back. When you are sure you are in the correct alignment, extend your arms upward and feel the spine lengthen. Feel your tail bone dropping onto the floor and the centre of the chest lifting up. Keep your shoulders relaxed as the chest lifts, Take a few deep breaths and then try to reach up a little higher. When your back begins to feel tired, stretch3 your body forward, actively reaching and stretching. After a few breaths, roll back up into the butterfly pose concentrating on the spinal alignment. The butterfly pose is a very stable way to sit as long as you don't allow yourself to drop into the lower back by slumping down or forward. Lie on your back and walk in toward your bottom. Lift your hips in the air as high as you can. Your feet should feel secure on the floor, and you should feel your shoulders against the floor, If you feel a lot of pressure in the neck, you can place a rolled up towel under the neck and shoulders. Feel the strength in your back. You need to extend up through the tail-bone, focusing on lifting rather than arching your back. If you think of it as solely an arch, you will place strain in the lower back. Ultimately you want to strengthen the back, not place stress in the vertebrae. When you are sure you are lifted as high as you can without dropping into the arch for the lower back, pay attention to your knees You want your knees to be directly over your feet. Feet can be hip width apart or slightly wider, but try not to open the legs too far or it starts to create instability in the knees as well as placing strain on the back. This challenging but very effective balance stretches the quadriceps, hips, back and shoulders. Start by grasping your foot the same way you would do for a quadriceps stretch. Push your knee toward the floor, pull the heel toward your bottom, and feel that your spine is straight and tall. If you have balance problems please remain at this phase of the pose until your balance has improved. The stretch you get through the front of the leg and hip make up for being unable to hold the extended balance. If you feel steady in the balance, reach you free arm forward. As you do so, extend the knee back, lean your chest forward, and open out the leg while you continue to hold onto your foot. You will feel your body tilt forward, but if you lift the chest as you arch into the back, you will find that you can stretch further out. Make sure that you don't drop forward. Think of the pose as opening out and lifting up. If you experience cramping in the hamstring or foot during this pose, you probably haven't warmed up enough. Do a few more stretching poses that are less strenuous, and then try again. The focus of the pose is the sacral chakra, but you are likely to feel an activation throughout the lower chakras. You may also find that if you are having trouble bringing yourself into balance in the pose, if you focus on your sacral chakra by feeling the muscles in the abdomen engaging, you will be better able to maintain the balance. Warrior pose 1 is a very popular and familiar pose, as well as a very effective one. Not only does it strengthen and stretch many sets of muscle groups, it enhances expansion into the sacral chakra and begins to clear the way into the higher chakras. It can be a nice pose to use as you transition from opening the second chakra to a pose that opens the third chakra so that the energy can move without restraint. The better the flow of energy, the more easily the kundalini can rise. To get into this pose, you step into a nice deep lunge. Keep the front leg in a fairly deep bend, but make sure you knee stays over your ankle. If you over extend the knee beyond the foot and ankle, you open yourself up to injuries caused by joint instability. One way to solve over extension in the lunge is to step out with your feet further apart. If you are flexible enough to over extend you are flexible enough to step more openly and do the pose more correctly. It will be harder to keep your balance as the feet move further apart, but you will build more strength and improve your flexibility when you do. So its worth it to go ahead and take wide lunges. Keep your hips fully turned in the direction of your front knee and actively drop the tail bone toward the floor,, engaging the abdominal wall to support your back. Doing this should activate your base chakra and begin to draw energy up into the sacral chakra, which is where you want to hold your focus. Ideally you need to keep your back leg straight, however, its perfectly acceptable to bend the back leg a little until the muscles stretch out, especially if you are having difficulty keeping both hips turned forward. The heel of the back foot can be lifted from the floor, which makes the pose more of a balance and keeps the back leg aligned with the hip and the front leg. Alternatively the heel can be rotated inward to get the foot flat. Rolling the heel in makes balancing easier, but creates a more powerful stretch through the hip. When your legs are firmly in place, raise your arms over your head and feel the centre of the chest lift. Warrior Pose should be a fairly low pose, but that will all depend on how deep a lunge you can maintain. It may take practice to get into a low warrior pose without arching into the lower back, over extending the knee of the front leg, or rotating the hips open. The most frequent problem that people have with the warrior pose is a tendency to roll the hips open. If you have your right leg front, you need to actively pull the left hip forward and visa versa. Begin by stepping out into the lunge, just as you would for Warrior Pose 1. Lower the knee of the back leg to the floor, extend your arms upward, push the hips forward, and feel your centre of balance. This is Kneeling Warrior Pose. Also like warrior pose 1, you want to keep your front knee over your ankle. Lengthen the spine so as not to exaggerate the curve of the lower back. Crescent Moon Pose is Keeling Warrior Pose with a back arch added. Feel the chest lift up out of the hips and lower back as you go into the arch. This will give you support through the back. Push the hips forward and think of yourself as reaching back and up rather than curving backwards and down. It is more like a lift than an arch, though the back will definitely be arching. As you back into the lifted arch, you should feel the energy surge up from the sacral chakra into the power chakra. People who have a slipped or collapsed disc, shouldn't perform the crescent moon pose but the kneeling warrior should be fine. Start by lying on your back. Walk your feet in toward your seat and sink your back down into the floor. You want to try to keep your lower back as close to the floor as possible. The lower back does naturally curve, so you may find it impossible to keep the back completely flat against the floor in this pose. There is nothing wrong with that. It is simply important to remember not to give in fully to the arch, but instead to feel the back always pulling downward. Keeping the back pulled toward the floor, roll the knees open to the sides, and press the soles of your feet together. Open your arms wide to the sides so that your chest, hips and ribs all feel open. Breathe deeply and allow your limbs to sink further down into the floor. You can relax into this stretch and let gravity do the work for you, as long as you remain aware of the shape of your back. Goddess pose is very rejuvenating. If you are looking for a method for stress relief, this pose is a good place to turn. To begin this pose, sit on your heels. Extend the right knee front and the left leg back, the back leg is straight, and the front leg is bent with the knee against the floor. For anyone with serious knee or hip problems, you need to remain there and simply stretch forward. If you don't have these types of physical difficulties move forward into the rest of the pose. Rotate the front knee open to the side and the foot of the front leg under your hip. Rotating the leg open like this often causes people to roll over onto the hip of the forward leg. Make sure you do not allow this to happen. You want to keep the hips level and centred, which for some people will mean that they are raised quite some distance off the floor. If you need to place a rolled towel under the hip of the forward leg to hold you in position more easily. Making sure to always keep the hips level, walk your torso forward and reach the arms out as far as they will go. Once you have reached out as far as you can, it is fine to relax into the stretch, letting gravity pull you toward the floor. For those who cannot sink down very low in the posture, you may choose to rest your weight on your forearms while you stretch. If you find you need to keep your hips more lifted, you can place a rolled towel under the hip of the forward leg to help you hold in the position more easily. Since you are stretching and activating several large muscles at the same time in this stretch, you need to hold the pose for a fairly long time to get the full benefit. Hold the pose for no less than 45 second before changing to the other side. As you stretch and lengthen into the pose, you can visualise the bright orange sacral energy warming your lower back and hips. This may help you remain in the stretch. The Solar Plexus or Power Chakra houses your spontaneity, self confidence, assertiveness, and inspiration. The solar plexus chakra is associated with creativity, but where the sacral chakra is the space for actual creation the solar plexus chakra is the space for the ideas and innovation. It is the creative thought centre, the space for the inventor. For example, a person with an open solar plexus chakra but a closed sacral chakra may have lots of creative ideas but no way of bringing them into being. A person with a closed solar plexus chakra and an open sacral chakra will be able to make things, but need to rely on someone else to have the idea in the first place. If the base, the sacral and the solar plexus chakras are open you will find a person who not only has the creative ideas but is also able to bring them into the physical and benefit from them. Most modern day innovators, entrepreneurs and inventors have their base, sacral and solar plexus chakras open, Bill Gates is a fine example. The benefits of having the chakras open are a sense of purpose, the ability to create something out of nothing, and the ability to get that something out there, as well as the ability to observe what is needed to achieve the goals. The solar plexus chakra not only generates creative thought, but also focuses your self confidence, be it confidence in your skills or physical appearance. This chakra is also associated with feelings of joy and physical energy. Someone who is depressed or is frequently tired is most likely experiencing a blocked solar plexus chakra. If you find yourself answering YES to most of these questions, your solar plexus chakra is most likely open. If you find yourself answering NO, then you most likely have a blocked or closed chakra. The solar plexus chakra rules the sense of sight, though not the ability to see, but the ability to perceive and observe. It has much more to do with being aware of what is around you than how physically well your eyes are. Someone with an open solar plexus chakra can walk into a room and note objects of interest immediately or be able to find a particular object. Someone with a closed chakra can't find objects even if they are under their nose. Child pose is a resting pose. When your body feels tired during a series of poses or a more strenuous poses that has been held for a long time, child pose allows you to rest and reset. Sit on your heels with the knees on the floor. Actively pull the hips and tail bone toward the heels. If your hips and thighs are fairly flexible, you will probably be able to keep your tail bone close to or touching the heels. It is acceptable if your hips lift a little. Curl your body forward, draping over the knees and release the shoulders, chest and arms down onto the floor. You can extend the arms forward or relax them by your sides. A good way to build physical endurance and actively clear the mind is to shift between child pose and downward facing dog several times without rushing the poses. Begin in child pose, take a few breaths to clear the mind and body, and then push up into downward facing dog, keeping the hands and feet in place on the floor or mat. Breathe deeply, and try to clear your mind. If you start to feel your mind becoming cloudy or distracted, lower the knees and fold back into child pose. Doing these poses is a good way to prepare to meditate. Child pose is a good way to reset yourself, as it allows your muscles to rest and clears your mind and body for the next pose. Triangle Pose and Side Angle Pose are very similar postures, so much so that people can get them confused. Both are excellent side stretches that tone the shoulders, chest, hips and strengthen the core. Think of your core as the set of muscles that give your body power and stability. They are your collective abdominals. The primary difference between these two poses is that in Triangle Pose, both legs remain straight. In Side Angel Pose, however, the knee bends in the direction of the side stretch. There appears to be a natural inclination to combine these poses, so that you end up with a kind of tilting, half stretched triangle pose, and the result isn't one or the other. Nor does it give you the full stretch or strengthening potential of doing each pose correctly. Triangle or Side Angle effectively. Open both arms to the sides and draw the stomach in so that your abdominals support your stance Rotate the toes of the right foot open, pivoting from the heel. That means pointing your right foot along the long length of the mat and pointing your left foot along the short length of the mat. Lengthen the torso toward the right side, when you feel as if you have reached as far as you can, tip your body down, reaching the right hand toward the floor, fingers of the left hand extending toward the ceiling. Make sure that both your legs remain straight, this means that you only reach the right hand down to where you can without bending the right knee. That puts you in a right side triangle pose. Some people will be able to perform this pose with their hand on the floor while others will only be able to reach their thigh. Anywhere that you can place your hand on your right leg is acceptable, provided that your body is correctly aligned. The alignment should be a straight line from shoulder to hip and from hip to leg. There should also be a straight line from the tips of the fingers of the right hand through the shoulders to the tips of the fingers of the left hand. Do not slump forward, keep your hips and chest open. If you are not sure, do the pose against a wall to see how the correct alignment should feel. In both the Triangle Pose and the Side Angle Pose, the face should be in profile. You can turn your nose to point toward your toes, or you can point your nose up toward your fingers. Looking down is less strain on the neck; however looking up will help you keep your shoulders aligned. The two best ways to get into the Side Angle Pose is to start from Triangle Pose or Warrior Pose 2. From Triangle Pose do a deep bend of the knee in the direction of the triangle and place your palm on the floor next to your foot. For those of you who can't reach the floor, you can either grasp your ankle with the lower hand or place your elbow on the thigh of the bending leg. The top arm can remain extended toward the ceiling or can be lowered to be next to the face, so that the arm follows the line of the body from the fingers down through the body to the heel of the extended back leg. If you are going into side angle pose from warrior pose 2, you would maintain the shape of the legs and lower body, and tilt the torso sideways toward the bending leg. The key to performing Side Angle Pose is that you want to have a deep bend in the knee. The hips should drop closer to the floor than they were in triangle pose. The wider your stance when you start, the more easily you will be able to bring the hips down and fully bend the knee. Ideally you need a right angle in the bending leg. Open your chest and keep the top hip lifted through out the pose. Don't forget to do this pose on both sides of the body. Twisting poses relieve spinal tension and massages the organs in the belly, which helps your body detoxify and keeps your internal systems running smoothly. They also push the solar plexus chakra wide open. If you are feeling tired or you feel your energy is stagnant, do a twisting pose, and the energy will begin to move through your body again. Standing twists like Revolved Triangle and Revolved Side Angle pose activate all three of the lower chakras, but especially open the solar plexus chakra. From a right side triangle pose (right hand extended toward the right leg and floor), turn your chest toward the floor, arms still extended, and then twist to face the wall that was behind you, placing the left hand on the right leg and reaching the right arm upward. If you cannot get your body twisted fully around, you can lessen the rotation by angling your body slightly forward rather than directly over the leg, and place your hand on a block or stack of books at the inside of the right foot. Try to create the same alignment that you did in the Triangle Pose: a perfect straight line from the tips of the left hand through the shoulders to the tips of the right hand. From a Side Angle Pose (right hand extended toward the right leg and floor), turn your chest toward the floor, arms still extended, and then twist to face the wall that was behind you, placing the left hand on the right leg and reaching the right arm upward. If you cannot get your body twisted fully around, you can lessen the rotation by angling your body slightly forward rather than directly over the leg, and place your hand on a block or stack of books at the inside of the right foot. Try to create the same alignment that you did in the Side Angle Pose. Don't forget to have a deep bend in the knee in the direction of the stretch. Begin with the mountain pose​, step the feet apart using the length of the yoga mat, open both arms to the sides, and pivot on the heel in the direction you wish to reach in your pose. Everything in Warrior Pose 2 leads in the same direction. If you turn your foot to the right, you will bend your right knee. If you are bending the right knee, you will turn your head to the right side and look over the tops of the right fingers. Be careful not to lean in the direction of the pose. Your body remains in the centre rather rather than actively reaching out past the knee. The entire body is in a straight line, your hips are in-line with your shoulders. The tail bone pint straight down to the floor and the hips are fairly low. Holding this pose for and extended period of time 4 to 5 complete breaths, builds strength in the upper legs and lower back. Warrior Pose 3 can be a little tricky at first, but as your balance improves and your back gets stronger, it becomes easier to perform. Balancing on one leg, tilt the body forward and extend the other leg straight back. Your chest, back and leg should be parallel to the floor. Arms are usually extended forward, staying inline with the body, or held with hands at the chest When you begin balancing, you may find it is easier to open arms to the sides until you have your balance and then extend them toward the front. The key point to remember for Warrior 3 is maintaining the line from the crown to the heel of the lifted leg. You never want your body to sag forward or break at the waist or hip. When you start sagging, either your back is not very strong or your abdominal wall is released. Many people, due to lack of strength or flexibility, find they cannot lean fully parallel with proper alignment. Instead, they balance at a lesser angle, which is the best option in the beginning. As your core gets stronger, you will be able to maintain a more horizontal posture. In Yoga, it it more important to have good form, rather than to try to achieve great flexibility. In this case, the perfect line of the spine from the top of the head through the hips and all the way down the leg is the focal point for achieving good form, rather than leaning out parallel to the floor. You should only move out to parallel if you can do so while maintaining the correct line in the body. Always choose a lesser angle of a pose that is strong instead of a sagging, unstable, incorrect shape that only gibes the illusion of stretching further. You will find that will most balancing poses like warrior 3, that one side is weaker than the other and will need the lesser angle until your strength has increased. Rest on your back and draw your knees in toward your chest. Open your arms to the sides and connect the shoulder blades to the floor all the way into the upper back. Keeping the legs together, knees side by side, rotate through the waist, rolling your knees to one side while rolling the head in the other direction. Hold the stretch. For some people, it is possible to reach their knees all the way to the floor, For others, the knees hover above the floor. Only rest the knees on the floor if you can do so with the thighs held together and both shoulders blades down (all the shoulder not just a portion), so that your entire upper back stays on the floor. Always roll the head away from the direction of the knees. Extend your legs so that they are stretched straight out from the body inline with the torso and then draw one leg up toward you chest and roll the knee over the extended leg. You can touch the floor if you are flexible enough or have a towel placed so that you can rest your knee on that. Roll the head in the opposite direction and hold the pose for 5 complete breaths. As with any twisting pose, you solar plexus chakra will be powerfully opened. 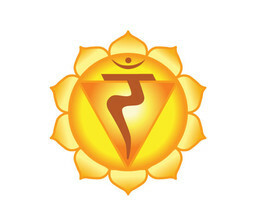 Feel the energy expanding at the centre of the body, in the solar plexus chakra, and then radiate in all directions,. The o pen strength of the solar plexus chakra during this restorative pose may help clear any blocks in the surrounding chakras. Both Bow Pose and Half Bow Pose strengthen the back, abdominals, hips and shoulders. It is probably best to attempt Half Bow first to get the back, hips , and shoulders stretched a little before going into Bow Pose unless you are a naturally flexible person or have already done several sets of stretching and warming yoga poses. To execute Half Bow, lie on your stomach with both legs extended back and both arms extended forward. Grasp your right foot with your right hand, pulling the heel in toward you hip and pulling your chest down to the floor. After a few cycles of breath, lift the chest, left arm, and left leg off the floor as high as your can. Lift and extend the right foot upward as far as it can reach while still being held by the right hand. Take a few deep breaths, lower to the floor, and then repeat on the left side, If you find that you are unable to lift very high in the beginning, don't despair. This will change as the back becomes stronger and more supple. You will do basically the same move for Bow Pose, but instead of stretching one side at a time, you will grasp both feet, draw them both in, and then lift up and open, As the shoulders become more flexible, and this will take a lot of practice, you may be able to turn the hands over, rotate the elbows up, and create a more over the head hold rather than just reaching the arms straight back. Once you become more adept at Bow Pose, you can try rocking the body forward and backward (onto the chest and then back to the legs) to massage the internal organs and increase both strength and flexibility throughout the body. If you are relatively flexible in the posture already, you may move on to rocking side to side instead. When you do the side to side movement, you'll rock fully onto your side all the way to the floor, roll up to the centre (returning to Bow Pose), and then roll fully to the other side and back up. Both rocking techniques are challenging and effective strength building practices for Bow Pose. The wheel is a backward bend. Place the hands and feet on the floor, and then lift the stomach, back and hips as high as you can. The thought to keep in mind as you do Wheel is "lift". Don't think so much about the arching. Just focus on lifting. Often when people attempt this move, they are focused on getting the chest and upper body lifted. Keep your focus on the hips. Take the hips up as high as you can, using the strength of the legs and the back, your upper body will follow along to get the hips higher. Lengthen the arms and legs up into the lift. When you are ready to come out of the Wheel, bend your elbows and tuck your chin so that the shoulders reach the floor first. Once your shoulders are safely down, you can lower your hips just as you would to come out of the Bridge Pose. For those who have less upper body strength or a very inflexible back, try placing your hands on blocks or books so that your lifting from a higher point. When you lift up into Wheel, first focus on lifting the hips and feel your energy drawing into the Sacral an Solar Plexus chakras. Pool your energy in your belly and reach it skyward. You should be able to stay up as long as your focus in in the lower chakras: the lifting and opening of the hips and belly. After you have lifted into the pose, you will feel your heart chakra open up, as well. Wheel is an excellent pose to open and expand the whole trunk of the body and flow energy powerfully through it. As you might expect, the energy of the Heart chakra is emotional. This energy centre is most connected with emotions like compassion, trust, forgiveness and kindness. Open heart chakras not only allow a person to experience more positive emotions, but it radiates those emotions so the person can more positively express and release negative feelings. Furthermore, when the Heart isn't blocked, a person not only gives of themselves in a more loving way, but receives love from others effortlessly. The ability to give, but not receive love is as much and indication of a Heart chakra blockage of some kind as the inability to give love. People, whose heart chakras are more closed may question the love of others, cling to unhealthy relationships and peer groups that pump volatile emotions into their experiences, or in more severe cases, experience no emotions at all. They may be very emotional, or very cold and thoughtless. However, the presence of negative emotions in your life is not a sign of heart chakra problems. It is important to remember that the emotions themselves are not bad, even what you might call negative emotions are not intrinsically bad. They surface for a reason. When the heart chakra is open, that person understands and fully expresses the emotion, good or bad, without question, fully accepting and trusting what they feel. When your heart chakra is closed or blocked, you question those emotions or express them in improper ways. It is safe to say that the more strongly you feel your emotions, the more open the heart chakra is likely to be. However, emotions may come out in a variety of ways. Pervasive feelings of sadness, depression, selfishness, jealously or mistrust could very well be coming from a problem in the heart chakra where the centre is open, but the energy is clouded or blocked from one of the lower chakras. Am I in touch with my emotions without being overly reactive or sensitive. A variety of different things can contribute to a person's emotional state, but generally speaking, answering yes to these questions means the heart chakra is not blocked. People with open heart chakras tend to be helpers and healers. They are typically kind, considerate and nurturing. Certainly, this doesn't mean you have to be a push over to the desires of others or to your own emotions. People who are very kind, but so selfless that they can easily be taken advantage of, likely have an open heart chakra but a closed solar plexus chakra. In contrast, a person with both the solar plexus and heart chakras open is likely to be self-confident and to make discerning decisions. Such people willingly choose to place their compassion with those they feel are deserving, but not with everyone who crosses their path. Cobra Pose is probably one of the best heart chakra poses for strengthening and stretching the back. In cobra, begin by lying on your stomach. Place your hands under your shoulders and lift the chest as high as you can, using your back and arms to lift, Pull both shoulders down to open the chest and lengthen the neck. Never lock your arms. In fact in cobra pose, it is best to keep a bend in the arms with the elbows pulled in to the sides of the body. The hips stay low to the ground, increasing the arch of the back. If your back is inflexible, you will keep you chest lower. The back and chest are the primary focus; however, you don't want to forget about the lower body. Make sure you keep your legs together and the feet aligned to the leg sot that your feet don't roll in or out from the ankle. Keep a straight line from the hip to the toes. Engage the abdominal wall to support the back throughout the pose. Cobra pose is so named because is looks similar to a serpent rising up and fanning out its hood. The image of the Kundalini is often depicted as a cobra, rising up the spine through the chakra points, and then opening up over the top of the head. Cobra pose focuses primarily on opening the higher chakras. If the lower chakras are already open you can begin to raise your kundalini through the crown as you breathe deeply in your cobra pose. Two poses that are similar and frequently confused with Cobra Pose are Upward Facing Dog and Sphinx Pose. Both poses also open the heart chakra . Sphinx pose is an easier pose and Upward Facing Dog is harder. For anyone who experiences back trouble in copra pose, sphinx pose is an excellent alternative. Instead of lifting with the arms, you press the forearms to the floor, keeping the elbows down, and just lift the chest. Open through the shoulders by pulling the shoulder blades down just as you would in cobra pose. Upward facing dog pose requires more back strength, but demands less flexibility. For upward facing dog, the weight is held by the arms and the tops of the feet. legs are straight, just as they are in cobra and sphinx; however, since the hips are lifted up from the floor, the legs also lift up and are held strong to support the body. The chest is lifted as high as possible, and while the arms may appear straight, you want to always maintain a micro bend of the elbows to prevent locking the joints. The three previous poses are equally useful in opening the heart chakra. Sphinx is best for anyone with concerns about their back or a very weak or inflexible back. Cobra is good for improving flexibility and moderate strength building. Upward Facing Dog is very much about building strength in the back and abdominals. Fish pose has several phases and variations, and you can add onto it as your back becomes stronger. To start, lean backward from Staff Pose. Bring the elbows to the ground and lift the chest, allowing your head to hang backward. Both legs remain extended forward. This is the first and most basic form of Fish pose. From that point, lower the crown of the head to the floor and use your back to lift. If you feel strain in the neck, continue using the arms for stability until the back strengthens and can hold you in the pose without dropping a lot of weight onto the top of your head. If you feel your back is strong enough to hold you in the arch, extend both arms forward from the chest. This is the second phase of the fish pose. When you feel comfortable in the second phase of fish pose, try lifting both legs to about a 45 degree angle from the floor, keeping the thighs together. Your back and abdominals should be doing most of the work so that there is still only minimal pressure in the neck and top of the head. Fish Pose can also be performed from the Lotus Position where legs are crossed so that the feet cross over the tops of the thighs. In this case, hold your toes as you lower backward onto the elbows. Lower the crown of the head to the floor in the same way that you would in the second phase of fish pose. All of these variations of the pose are excellent for stretching open the chest and building strength along the spine. You will feel the expansion of the heart chakra during this pose. You may also feel some opening and expanding in the higher chakra centres. If you energy is already open through the lower chakras, you can pull energy from the solar plexus chakra up into the heart chakra and feel the heart chakra opening. The placement of the legs is much less important than the placement of the arms. You can either pull one leg in close and cross the other over it, as far across as you can get the legs to cross, or you can sit on your heels, knees on the floor. Some people find both of these leg positions extremely uncomfortable for any length of time. If that is the case then you simply sit on the floor with you legs crossed in front of you. Reach one arm up toward the ceiling, and then bend the elbow, dropping your hand down behind the head. Walk your fingers down your back as you reach the elbow up as high as you can. Reach the other arm back and under. You will end up with your hands clasped behind you back with one elbow straight up toward the ceiling and the other straight down toward the floor. If your shoulders are tight and you are unable to reach the hands together, you can hold a strap or a towel in your hand. Grasp the towel and each time you perform the pose, walk the fingers a little closer together. Over time, your fingers will meet, and you will no longer need the towel. From Mountain Pose, extend the arms upward. lengthen the back, lifting out of the hips, and extend the arms and upper body backward. Make sure that you keep the head supported so that it doesn't drop backward and create strain in the neck. Pay attention to your lower back. You never want to drop your weight into the lower back to create the arch. Think less of arching and more of reaching. Support your body's weight with the strength of your back. Keep the legs and buttocks firm, allowing the hips to push forward while still lengthening the back. It's good to follow up a pose like the back arch with an opposing stretch such as Forward Bend. These two poses together are particularly good for relieving pain in the back from strained or tired muscles or for strengthening the back after an injury. This pose opens several chakras at once. Although it starts in the heart chakra as the chest lifts and opens, it is easy to move this poses focus from one chakra to the next depending on the deepness of the back bend. There are a wide variety of spinal twisting poses. This one has been chosen because it is accessible to all types of bodies and physical fitness levels. Begin in a seated position with the legs extended forward. Draw your right knee up with the sole of the foot against the floor. Twist to the right side (always twist toward and over the knee) while reaching your right hand toward out behind you. Turn your head so that your gaze follows out over the tips of your fingers. Bring your left arm over to the outside of the right leg, which will push your shoulders a little further around in the twist. You can hold that position, or bring the right hand down to the floor. In any case, make sure that you are always trying to turn a little further around with each breath. Always keep both sit bones connected to the floor and keep the spine tall so that you don't lean backward instead of twisting. The energy of the throat chakra is communication; the ability to put your thoughts into words or to make your thoughts heard. 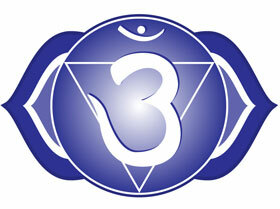 Other forms of expression also fall under the influence of the throat chakra. 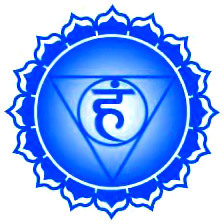 The desire to sing, write, paint or otherwise put your thoughts into expression also relates to the throat chakra. When a person has trouble finding the right words to express their feelings or desires, or when your words often convey a different meaning to the people with whom you try to communicate, it is likely that that you have a blocked throat chakra. People who are natural speakers or writers have open throat chakras. Am I able to convert my thoughts into physical words, such as writing a book, letters, emails. When I'm moved to express my feelings, do I have ways of expressing it, that accurately portray my feelings. Do I usually understand others when they try to communicate with me. The throat chakra is a two way street; its not just about reaching others with your thoughts, its also about hearing the thoughts and desires of others when they are expressed as well. Everyone has difficulty putting their needs into words at some point or another, but the more open the throat chakra, the more easily you can choose the right works to reach the person you wish to communicate with. When you feel a strong urge to tell someone about something but find yourself at a loss for words; write it down and then read it out to the other person, also practice speaking out loud even if it is just to yourself. Don't let your brain run ahead of your tongue. Head rolls mainly release tension in the neck and shoulders. When you perform them, you should always keep your back straight and tall. There is a tendency to want to slump during head roll, but doing so will decrease their effectiveness and stops the kundalini energy flow. Make sure that you keep your shoulders relaxed during the circles, as well. Tuck your chin toward your chest and let your head roll all the way around to the side, through the back, to the other side and back around to the front. It is helpful to roll in the same direction several times and then roll in the other direction several times. As your head rolls toward the back, be careful that you don't allow the head to drop all the way back, which crunches up the little bones in the neck. Instead lengthen the neck so that the crown of the head extends back and a little up rather than dropping and staining the vertebra. If you experience pain, uncomfortable popping or grinding, or have injuries to the neck, you should not perform the full circle in the head roll pose. Instead, allow the head to simply rock a little side to side. This pose is performed while sitting on the heels with knees on the floor. Place your palms on your knees and lift your chest, drawing it forward. Open your mouth and wide as you can and stick your tongue out. Imagine you are trying to touch the tip of your tongue to your chin. As you open the mouth, roll the eyes to look upward at the ceiling while opening the eyes wide. The pose mimics a lion roaring, you don't need to roar out loud but it would be fun. If it is uncomfortable for you to sit on the heels either through tightness in the hips or tightness in the knees, you may choose to place a rolled towel or blanket over your calves before sitting back. Lion pose is very powerful. You can imagine the throat chakra opening and energy from it spilling down your tongue right out of your mouth. Since the heart and brow chakras are also likely to be activated, you can easily sift your energy from one of these chakras to the throat and then on to the other, which will help open all three chakras. The plow plough pose, is commonly used to stretch the back and the neck. Lie on the floor on your back. Using the strength of the abdominal muscles, smoothly lift the legs and hips up into the air. Continue reaching up and over until the legs are parallel to the floor. Feel the strength in the back and torso. Continue lifting your tail bone as you extend the feet over your head to the floor. You can either stabilise your arms against the floor, or, if you are have difficulty staying in the pose, you can support your hips with your hands. Your weight should be primarily resting on the shoulders. Make sure you are not over extending and placing stress on the neck. Some people can get into the pose but are not flexible enough through the back to reach the floor with their feet. Don't worry too much about that. As the back loosens up, you will eventually be able to reach the floor without straining your neck or back. If you have trouble bringing your weight out of the neck onto the shoulders, place a folded towel under your head and shoulders before going into the pose. If you can get rolled part of the way over, but have trouble staying there, or feel your back is being strained, you can lie in front of a chair, and as you roll into the plow, allow the legs to rest on the seat of the chair. Also, if you have any neck, shoulder or back injuries, avoid this pose. Never use the bodies momentum to roll the legs over. Throwing your weight over your head like that can cause serious back and neck problems. Only do the pose if you have developed enough abdominal strength to lift up and over smoothly. Shoulder stand strengthens the back and is a great alternative to doing head stands for those who are unable or uninterested in learning to stand on their head. You need to be able to perform the plow pose well before you begin doing the shoulder stand. From Plow pose, raise both legs so that your toes point toward the ceiling. Ideally, you want to create a straight line down through the legs and the back to the shoulders. As in the plow, you can either place the arms against the floor or support your hips with your hands. Shoulder stand can also be done with a folded towel under the shoulders to relieve any strain on the neck. You want to always feel as if you are lifting through this pose. Lengthen the body and feel your energy reaching upward. The success of the pose is determined largely by back and abdominal strength. You may find at first that your body arches in the direction of plow pose. Over time, however, you should be able to straighten the body out. The effort alone will help you build strength in the trunk of the body, even if you are not able to reach the legs directly up in the beginning. Once you become adept at the basic shoulder stand, you can continue working on your strength and balance by shifting the legs into other positions. You might open both legs to the sides and maintain your balance there, or you might draw the soles of your feet together as they would be for Butterfly Pose. You can also alternate the positions of the legs, reaching one toward the floor as the other extends toward the ceiling. Sitting with the soles of the feet together, cross your arms and grasp your ankles so that your left hand holds the right ankle and the right hand holds the left ankle. Lift your chin, being careful not to drop your head backwards, and arch your back, pushing the ribs forward and the chest upward. Pull your shoulder blades together and drop the shoulders. This is the bound butterfly pose. You can alternatively rather than cross your hands over simply gasp each foot if you don't have the flexibility to cross your arms over each other. Chanting is not integral to all forms of Yoga, but it is widely associated with yoga practice. The purpose of the mantra (invocation or incantation, spoken or chanted) is to clear the mind while opening up the chakra system. Always sit in a grounded position when chanting, to maintain optimal spinal alignment, which allows your energy to flow unhindered through your chakra system. The mantra must be uttered aloud. Not only does this fill your ears and thoughts with only the mantra, but it pulls the throat chakra open. Your needn't be afraid of your own voice, though many people are often timid or embarrassed at first to allow sounds to emanate from their body. Perform the mantra in a loud, clear voice. Speak with purpose. It will be more effective that way. The vocal tone should be slow and even. You cannot rush your way through a mantra set - the slower and steadier, the more effective the practice. It is this resonating of sound that breaks up the blockages in the throat chakra and may reverberate through all the chakras, activating all the way down to the base and up to the crown. If you are very focused in your mantra, you could have your kundalini energy rise all the way up through the crown where you will be in a state of bliss or oneness. You could even chant a mantra focusing on each chakra, using the openness of the throat, to clear a path all the way up for the kundalini to travel. 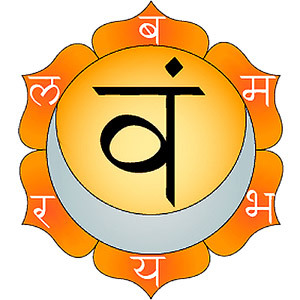 There are many mantras but by far the most popular is the simple "Ohm Shanti." You simply repeat those words until your mind clears. "Ohm" or "AUM" is the sound of higher spirituality. It connects the consciousness with the divine. "Shanti" means "balance" or "harmony." Saying a mantra encourages the mind and body to let go of fears, worries, pain and stress. The mind is encouraged to stay in the moment, which will be useful when you begin to meditate. 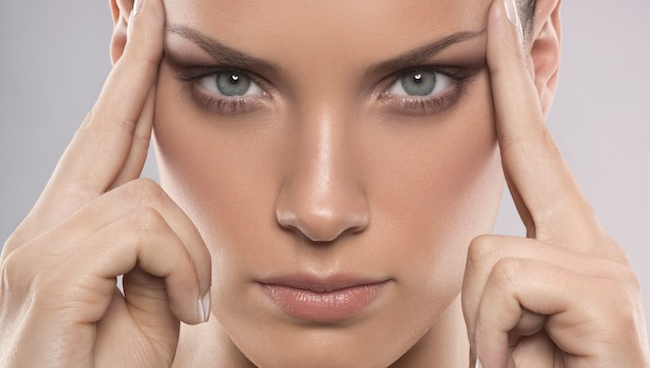 The Brow or Third Eye chakra is located at the centre of the forehead. The brow chakra is the visionary centre, the central point of spiritual belief and conviction. It is also the space of dreams. People with very open brow chakras tend to have strong spiritual conviction or religious faith and feel with certainty the existence of things beyond the physical world, whereas those with a closed or blocked brow chakra may feel uncertain of their faith, unable to decide about their own convictions, or may be very pragmatic or even dogmatic in their faith, following blindly rather than feeling what they truly believe. The more in touch a person is with the astral world or the spiritual realm, the more open their brow chakra. This could manifest as a very deep devotion to a certain faith that is honest and heartfelt for that individual, or a very open but secure spirituality that extends beyond any one religion. People who experience premonitions are tapping into the power of an open brow chakra. Dreams also reside in the third eye, and not only dreams, but also nightmares. One might tend to think that having nightmares indicates a closed brow chakra, but the opposite is often true. Having a chakra that is open doesn't dictate the type of dreams that you have, but instead how vivid the dreams are determines whether the chakra is open or closed. Any time you experience deep, vivid sensory events during dreams, it derives from an opening of the brow chakra. People with an open brow chakra are more likely to remember their dreams, and in greater detail. Premonitory dreams are a sign of an open brow chakra. If you have trouble remembering your dreams, or have detached, vague dreams that lack continuity or clarity, your brow chakra may be closed. Am I fulfilled by my faith. (do I have clearly defined spiritual beliefs that I am certain about and abide by. If you answered YES to most of these questions, your brow chakra is open. If you answered NO to most of these questions then your brow chakra is most likely closed. The strength of your conviction when you answered YES indicates the degree of openness that you are experiencing. Visualisation​ is one of the key elements for working with the brow chakra. The ability to visualise or imagine either visually or physically in your body, stems from the brow chakra energy. For this reason the more open the brow, the more benefit a person gets from experiences such as guided relaxation and hypnotherapy. You have been asked to do focused breathing throughout your poses. In fact, any type of focused breathing activates your brow chakra. You can use your breath to bring focus into any pose or into any chakra, but no matter how you use the breath, it will always stimulate the brow chakra to some extent. There are many ways to learn controlled and focused breath and many types of breath work used in Yoga. The procedure outlined below can be used during poses, during meditation, during visualisation, or as single exercises effective by themselves. Breath work is a tool. It brings the mind, body and spirit into greater unification with each other. If you find that you are losing focus during a pose, a meditative practice, visualisation, physical endeavour or life in general, deep, controlled breathing will bring you back to the focus you need. Breath work is not only integral to but necessary for the successful practice of Yoga. A great many ills of the body and mind can be combated through proper breathing. Learning to consciously breathe deep, complete breaths relieves tension, improves digestion, aids in sleeping disorders, improves the immune system, relieves early symptoms or migraines, clears the mind, improves memory, improves mental function in daily tasks, relieves all forms of fatigue, increases the metabolism, improves the function of organs including the health of the brain, strengthens the lungs, overcomes lung disease and cleanses the body. As you have read, there are many benefits to proper breathing and practice of breath work. This method can be used by anyone, totally separate and outside your yoga practices, and it carries the greatest amount of rapid benefit. Practising the counted breath for even as little as ten cycles of the breath (a cycle is a full breath in and a full breath out) each night and each morning is enough to see a change in your daily breathing habits and for you to begin to reap the rewards of proper breathing. You can practice the counted breath while sitting up straight or lying flat on your back. When you first begin practising, you may find it easiest to practice while lying down. Never lie on your side or stomach. You can sit reclining, as long as you don't slouch. Lying flat or sitting tall works best because you want to be certain your lungs have room to fully expand under the ribs and that the diaphragm will have full, unobstructed movement. The diaphragm is the long, flat muscle that runs under the rib cage. 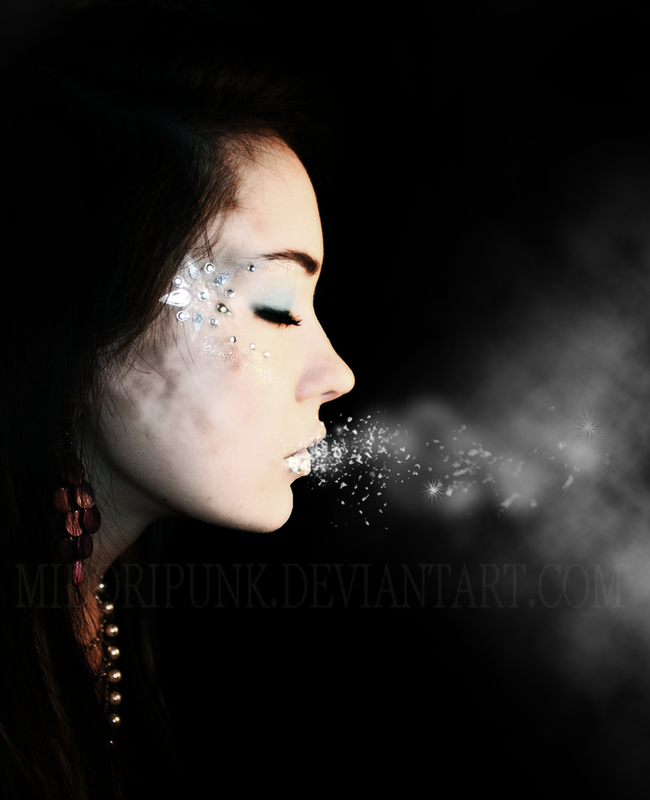 It controls the flow of breath in and out of the lungs. Begin by lengthening your breath. To do that, draw your breath in a little deeper and flow it more completely out. The goal for the counted breath is to create a balanced breath rhythm where the in cycle and the out cycle are the same length. Start with a slow steady count of eight, ten or twelve. As you become more adept, you will breathe to higher numbers. A ten count is the easiest at first. Breathe in for a count of ten and then breathe out for a count of ten. Continue breathing in and out, staying with your count and keeping it slow, allowing the breath to flow as you count. People often begin to speed up the count the longer they continue the exercise. Be wary of this; if anything, make the count slower as you go. Use an eight count if you have lung problems and need to build up your lung capacity. Another excellent practice to add to the counted breath is a cycle of locked breath (or held breath) between the in cycle and the out cycle. A held breath of ten counts is best, but five is adequate for beginners. With the held breath added, your complete breathing cycle would run like this: breathe in ten counts, hold breath ten counts, breathe out ten counts, then immediately start the cycle again. This type of controlled breathing is especially effective for relieving stress, improving sleep, increasing energy levels and increasing metabolism. A breathing exercise does primarily open the brow chakra, but it also contributes to the opening of the other chakras as well. This is one of the reasons why continuous deep breathing is incorporated into yoga practices. Using the breath in conjunction with poses also makes it easier to keep the mind clear and to focus on being in the correct form in your pose, which facilitates the flow of kundalini. Proper breathing gives your body greater endurance for holding poses and allows for the free flow of energy through all the chakras, making a powerful connection to the kundalini. This technique is excellent for relieving eye strain and sinus pressure as well as opening the brow chakra. It's also a very relaxing process and can be a nice way to release tension or wake yourself up a little. Close your eyes and place the heel of your hands over the eyelids. Apply only very gentle pressure as you slowly rotate toward the outer edge of the eye socket and then back in toward the bridge of the nose. Repeat for several strokes and then bring the hands down, and keep the eyes closed through several slow cycles of the breath. Never apply hard pressure into the eye or rub the eyelids. You don't want to agitate or irritate your eyes, you just want to massage the muscles in the eye socket. If you have injured your eyes or had a recent infection, wait until everything is healed to perform a massage technique. If your eyes are dry, you will want to remove any contact lenses first. If your eye is well lubricated, you should be safe to use the eye palming technique while wearing contacts. However, if you think they might move in the eye or you feel at all uncomfortable, go ahead and remove the lenses first. All types of massage open the brow and crown chakras. In fact, if you have a very good masseuse, you will find that being massaged can clear blocks from any of the seven chakras. Begin by applying pressure with the pads of the fingers along the bony ridge of the eyebrows. Begin just above the bridge of the nose and press gently outward, following the contour above the eye toward the temple. Repeat for several strokes, left hand gliding along the left side of the face and the right hand gliding along the right side of the face, and then massage in soothing circular strokes right over the temples. Drop both hands down to the bottom of the ear, lined up with top of the hinge of your jaw. Allow the jaw to hang loosely open as you repeat the same circular strokes into the top of the jaw. Then place your fingers under the jaw, behind the ears and tip your chin slightly up, lifting with both hands. Last, place the fingertips together on the bridge of the nose. Follow the bridge of the nose about half way down and then allow the hands to part, each brushing out over the cheeks just under the eyes. Repeat this stroke several times and then let the hands rest in your lap, close your eyes, and breathe a few short, deep, cycles of the breath. Relaxations are a great way to end any yoga practice. If you need to jut let your mind and body drift off for a little while, a brief guided relaxation could be just what you need. The better your connection to your breath, the more effective the relaxation. Relaxation is NOT meditation. It is a step on the way to achieving the meditative state. During relaxation, you actively visualise, daydream and allow the mind to review and release things, that has been churning in you over the day. During meditation, the mind is still. There are no wandering thoughts, no images, no mulling over things. Relaxation is much easier than meditation. During relaxation, you begin to slow the stream of conscious thought that pours through your head. You focus your mind and allow your mind and body to become fully relaxed. If you fall asleep the brow chakra will still open but the aim is for conscious relaxation not sleep and dreaming. There are many images that you can use for visualisation​ during relaxation. You can choose any of the poses where you are lying on your back on the floor. Two of the best are Corpse Pose or Restful Pose. 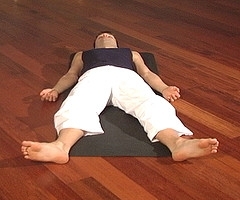 Corpse pose is simply lying flat on the back with your arms and legs extended slightly apart. You can place blankets, pillows, or bolsters under your knees, lower back, neck or head if you are more comfortable that way. Comfort is very important to relaxation. In Restful Pose, walk your feet in toward your bottom, and walk them sideways. Allow the knees to roll in so that they rest against one another. This pose relieves the lower back if you feel any pressure in the back when in corpse pose. Begin by focusing on your breath. Feel the rise and fall of the chest as you breathe in and out. As you breathe in, fill your body with the feeling of being joyful, revitalised, healthy, peaceful and fulfilled. As you breathe out, release any pain, frustration, anxiety, illness, stress, self-doubt or fatigue that you feel in your body. Breathe all of those things out. Release them. Replace those negative feelings with the joyful sensation of the in breath. Allow the joyful sensation to wash all the way down your body, from the top of your head to the soles of the feet, filling every muscle, every joint, and every cell in your body. Each time you breathe out, feel any tension in your body draining away, leaving your entire being cleansed and revitalised. Then let your thoughts fall away and allow your mind to clear. Imagine you are floating on a soft cloud in the clear blue sky. The warm sun shines down on you. It is quiet and peaceful. You can drift joyfully along, supported by the flowing of your breath. Savour each moment of each breath. The crown chakra is your connection to the divine. The crown chakra is connected to your sense of being or even existence itself. It is the stillness that is your sense of life force (the seat of the soul). 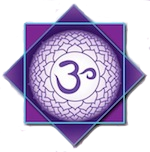 Connection to the crown chakra promotes inner peace. When the crown chakra is open, you are more receptive to information and can more easily retain knowledge. Curiosity often stems from the crown chakra. A closed crown chakra leaves you with a lack of awareness of things around yourself or an inability to maintain interest in things that are part of life. As the qualities of the other chakras are drawn up through the crown, the open crown chakra imbues you with both understanding and awareness, which leads toward enlightenment. The energy of the crown chakra connects you to divinity or whatever higher power in which you believe. The brow chakra moulds your beliefs and the strength you have in your religious or spiritual convictions, but the crown chakra is the portal beyond yourself into your higher self, your higher state of consciousness. If you answered mostly YES then you have an open crown chakra, If you answer mostly NO then you have a closed or blocked crown chakra. The crown is the final step in attaining your highest potential. Beyond it is the universal life force that fills every persons being, physically, mentally and spiritually. Meditation is probably the most difficult aspect of Yoga. The act of pure, total meditation is considerably more challenging than doing poses. Poses are done prior to meditation to move energy through the body, release tension, and still the mind so that meditation and relaxation are more successful. However it is important to remember that meditation, like yoga poses, is a tool to be used while pursuing the yoga path, not the goal itself. The true goal of yoga is to achieve total unity of body, mind and spirit. Meditation is a step toward living in unity and harmony, not just with yourself, but with those around you as well. Meditation is the act of stilling the mind and observing the silence. People often confuse meditation with relaxation. When you relax, your mind wanders off and thoughts trickle through, fuelled by the churning in your subconscious or by gentle images you conjure up with your imagination. During meditation, there are no thoughts, no images, no ripples on the quiet surface of the mind. This is not impossible, but it is difficult. True meditation is definitely not something you can expect to just sit down and do at will. In fact it can take years to truly and effectively reach a pure meditative state. If you work at it consistently with an honest intention to clear the mind and not just to sit quietly and still, you will eventually achieve that pure, true meditative state. It will take time and a significant investment of time and dedication. The first thing you need to do in the process is still your body. You probably notice, if you sit down in a supported pose either on the floor or on a chair, with your sit bones equally settled and your spine straight and tall, its tough to remain perfectly still without twitching, fidgeting, coughing, sneezing, shifting your weight around, moving your hair out of your face, or changing your position for even ten minutes. Don't ignore these things, if you get a signal from you body because you will be distracted and you will never be able to clear your mind. Deal with the distractions before you start. The best way to still the body and get your mind ready for meditation is to do poses. There are two good methods that will help still the symptoms as you begin working toward meditation and they are, do twenty four sun salutations either A or B in succession, or hold Downward Facing Dog for at least thirty minutes. If you do enough of these, your body will be glad to sit and be still. Your mind will usually have stilled significantly also. Once you have successfully stilled the body, you need to still the mind. Stilling the mind is much more challenging than stilling the body, though both the sun salutations and downward dog give you a good start on clearing your mind. First choose a comfortable seated position. Either on the floor or on a chair if you have mobility problems. The position must be seated with your back straight and no slouching. Meditation is about existing in your state of being and not drifting off somewhere. The best way to get there is to sit with good posture. Make sure you get any potential distractions out of your system before you start. Begin stilling the mind by focusing on your breath. You can use the counted breath, to help clear your mind. It is easier at first to concentrate on the numbers when your body is still. Think only of the numbers that roll through you mind with the breath. After a while, the numbers will naturally fall away and only the breath will remain. If you find stray thoughts start creeping back in, come back to your counting and continue until the mind clears again. Over time this will evolve into meditation. You can also try staring into something until your mind clears. Some people use a candle flame. You can set the candle at eye level or just lower and let your vision dissolve into its brightness. Most people will have a natural inclination to close their eyes. Listen to the stillness behind the eyelids. If you loose your focus, open your eyes again and stare at the flame. You can also use a mandala as a focus point while clearing your mind. 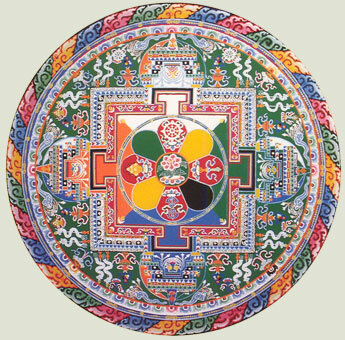 A mandala is a symbolic image representing the universe with a square of the four deities enclosed by a circle. Their primary purpose is to give your mind a productive thing to meditate on that leads it toward stillness. In the same way as the candle you may eventually feel the need to close your eyes. You may also try combining this visual meditation, which is in one sense a form of hypnosis that programs the mind to be still, with breathing cycles. You might try doing counted breaths while staring into and through your chosen object, or begin the counted breaths when the eyelids feel ready to drop closed. Chanting also makes a great tool for clearing away the stream of conscious thought. If you chant the same sound or mantra long enough, it will begin to fill your head and clear your mind. When the chanting stops, the silence that follows will fill you up. Sun Salutations are a very effective way to warm the body and prepare the muscles for more difficult poses. Normally you begin your yoga session with sun salutations and then go onto the poses for the chakras and finally finish with a set of sun salutations prior to meditation. Sun Salutation B - consists of the following poses, perform them one after the other without pauses in between. 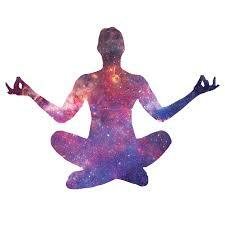 The act of meditation, even attempting meditation clears the crown chakra. 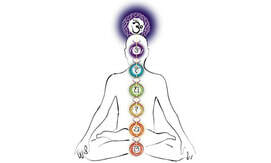 All the other chakras usually open also, because the connection of all seven chakras creates the best environment for true meditation. Simply reaching into the crown and opening it with the intention to meditate tends to begin loosening blocked spaces in the rest of the chakra system. Its not an easy practice, but is well worth the effort. Not only does your health begin to improve, but your relationships with others and your clarity and effectiveness in day to day tasks takes a giant leap forward when you make active meditation a part of you routine. Why Not Colour Your Own Mandala?